What is a dream, anyway? A hope for some, a wish for some, an inspiration for some while reality for those who work towards achieving them. Dreams can make you persuade them, dreams can tire you, dreams can make you believe, dream can make you quit. But what we dream of, do we really become? A question that cannot be answered until you dream something for yourself and then chase it down, dreams cannot be a phenomenon without the efforts one needs put in at different levels from physical to emotional. I recently read Men And Dreams : In The Dhauladhar, a book by debut author Kochery C. Shibu who was born in Kochi and lives in Bengaluru now. A graduate from NDA Khadakwasla, he has also served the Indian Navy and commanded two warships. The author has also executed several hydroelectric projects across the country and this experience of his also influences his characters and the writing. 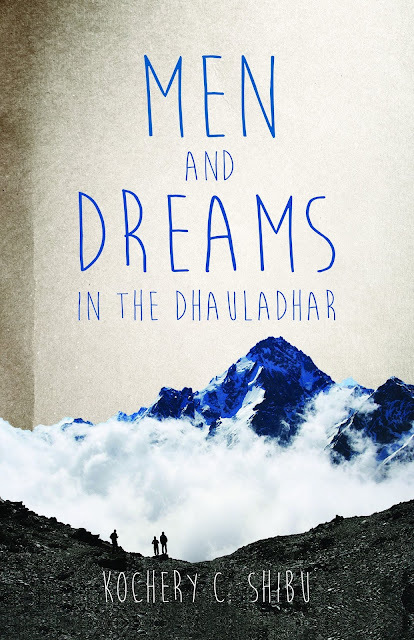 Men And Dreams : In The Dhauladhar is an interesting tale of humans and their character, their survival, their hopes and their expectation and also questions us, if we always do enough to set those expectations in the first place and then to accomplish them. It is not about a dream, it is about what we dream. Men And Dreams : In The Dhauladhar is one of those books wherein the characters are very strong, strong enough for you to turn the pages without being dependent on other forced twists and turns. The mesmerizing cover and the intriguing blurb where you read the first mention of the three important characters, add up to the your expectations and will make you curious to know about the story. The characters in the book Men And Dreams : In The Dhauladhar, may not be relatable to people you often meet, but their descriptions, of the past and the present, covers up for that and then you want to know more about these characters who meet at a dam construction site in the Himalayas and how their lives, not intertwined in the first place, are attached to the construction site. The local and regional languages and dialects are used at regular intervals in the story, thus increasing their relevancy to the plot. The almost perfect mentions of the technical and natural surroundings of the dam construction site make it superb. The narration of the book, Men And Dreams : In The Dhauladhar, in totality is good, but in the initial chapters where only the characters are introduced, you may wonder what the story or the plot is all about, but once you are through several character introductions, the plot starts revealing itself. The choice of words is very descriptive, detailed, definitive and interesting which reveals the thrill, philosophy and fictional side of the story. Apart from a few typos and formatting errors, Men And Dreams : In The Dhauladhar is a beautiful read and I would recommend it to anyone interested in reading fiction.